The long-time editor of Golf Magazine gives quick, clear, basic advice for scores of golf’s most common challenges, whether it’s fixing imperfect alignment or dealing with a buried lie. 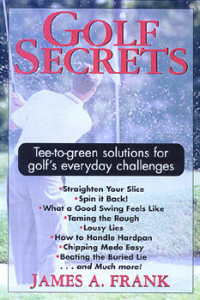 And tips and tricks in abundance here to give any golfer a better game—finding the sweetspot on the putter, hitting the flop shot and the “Texas wedge,” and many more. Jim Frank is the former editor of Golf Magazine and the co-author with Dave Pelz of Dave Pelz’ Putting Bible and Dave Pelz’ Short Game Bible.